Childhood and teenage years are foundational in our development as human beings. It is when our personalities are formed, our view of the world developed, and our ways of relating to others and to ourselves established. The skills and tools we learn in our early years have a huge impact on the rest of our lives—and that is why meditation is such a great gift to give to a child. I started meditating when I was just 14—and this practice gave me many things in my life. I am grateful that I came to meditation at such an early age, and I know that many other kids and teenagers would also greatly benefit from it. So on this page I explore why kids should do meditation, how to teach them, and the different types of meditation for kids. If you are a parent, or you work with kids or teenagers, this article is for you! That is not only one man’s opinion. In fact, the American Academy of Pediatrics (AAP) encourages parents to share meditation with their children—and teachers to incorporate mindfulness training into their lesson plans. Let’s see why this might be so. It’s the dream of many parents to be able to calm down their kids, teach them how to manage themselves, and see them grow into happy, healthy and fulfilled individuals. While there are many challenges in this process, meditation can definitely be a powerful tool to make this happen. In our modern society these problems are aggravated by social media (which amplifies the effects of bullying and social pressure), excessive stimulation from media and technology (leading to more restlessness and to a shorter attention span) and a climate of increasing violence (school shootings being its extreme manifestation). As a result, mental health issues in kids—such as anxiety and depression—are increasing. In fact, according to Beyond Blue, it’s estimated that around one in seven kids experience mental health difﬁculties and about half of all serious mental health problems in adulthood begin before the age of 14. There is also an estimate that, between 2003 and 2012, over two million kids in the US were diagnosed with ADHD—and for most of them the problem started before the age of six. So it seems that kids have the cards stacked against them. In this context, it is our responsibility as parents and educators—and as a society—to teach our young generation tools that can make a real difference. Meditation gives kids the tools to deal with their emotional challenges, and grow into health and mature individuals. Less ADHD. A Midwest elementary school conducted an 8-week mindfulness program with 3rd-grade students, after which teachers reported less inattentiveness, less hyperactivity, and fewer symptoms of ADHD (source). A similar result was found by a study done at the National Therapies Research Unit at the Royal Hospital for Women in Sydney (Australia), where children who were taught to meditate improved attention spans markedly, and either reduced or stopped their medication completely. Students are more focused and settled, calm and rested, according to a Students are more, according to a Swinburn University study (source). Better school performance. San Francisco schools offering meditation programs reported satisfactory English scores on the standardized California Achievement Test at a rate twice that of non-meditation schools. A California middle school providing daily meditation programs to their youngsters saw an increase in grade point averages for most participants in the program. Another study done in the San Francisco Unified School District with more than 3,000 students found a dramatic improvement in overall academic performance, including a spike in math test scores for students who practiced mindfulness meditation and “quiet time”. Meditation was also found to help kids improve their relationship with their parents, improve impulse control, build self-esteem, improve empathy and social skills, decrease test anxiety, and reduce post-traumatic symptoms. We can expect that many other 76 benefits of meditation would also apply to them as well. With meditation, kids learn how to better manage their bodies, their energy, and their emotions. There is an increase in emotional intelligence, positive outlook of life, and in the ability to regulate oneself. Kids develop better organization skills and learn to be more present and less judgmental, responding rather than reacting to their life events. They feel better, learn better, and sleep better. The skills that will come about as a result of meditation will unfold in many aspects of that child’s life, and will be carried over into the teenage years and on into adulthood. It becomes an integral part of their development and their resources for navigating the world. It helps set them up for a happier and healthier life. Teaching kids is different from teaching adults. Kids have less patience, shorter attention span, and less capacity to sit still. On the other hand, they have a greater imagination, a sense of playfulness, and they learn by example. As a result, in order to teach meditation effectively to kids, keep the following six principles in mind. The most important thing when teaching kids to meditate is to present the practices in a more interesting, fun, and engaging way. Never allow it to become boring for them. Make it feel like a pleasant activity—like play—and the kids will want to do it again. The principle of “make it fun” means that you need to choose techniques that are by nature more engaging for kids—such as working with their senses and imagination. It also means that you need to adapt the meditation instructions so that they are more interesting. For example, instead of asking the kid to “watch your breath”, you can ask her to place a small toy on her belly, and watch the toy move up and down as she breathes deeply. Ask her to try to make the toy move as slowly as possible. There you go, you just taught her deep breathing without her even noticing! Of course, the approach depends a lot on the age—is your “student” a kid (6-9), tween (10-13), or teen (14-17)? The way you would teach a 5-year-old is different than the way you’d teach an 11-year-old. Those teaching meditation to kids will need to adapt these principles and the techniques according to the age and personality of the kid. Most children find it hard to understand abstract concepts. Rather, children enjoy activities that allow them to use their imagination and creativity. So make sure you engage their imagination in the practice. Kids don’t have the patience to sit still for 20 minutes. So keep the practice short, especially for kids under the age of 10. They should never get bored with the practice, but leave it with the feeling of “wanting more”. A general guideline is to make the sessions as long as the child’s age, plus one. So if your kid is 8, make the session at most 9 minutes long. You can use a meditation timer app with a bell, to make it more interesting (I recommend Insight Timer). Kids learn more by imitating than by following instructions. They like to imitate adults and feel older. So the best way to teach a kid to meditate is for you to meditate! All eyes are on you, so be sure to set a solid example of how to incorporate meditation into your daily life. Do you want your kids to meditate? Be the example. This also means that you need to meditate with them. Do you want them to be regular and disciplined in their practice? You’ll need to be disciplined yourself, and make meditation a family practice. At the end of the practice together, ask them about how their experience went. It can be a great idea to ask them to draw what their meditation session was like, what they experienced in it, or a “before and after” drawing. This further encourages children to develop self-awareness and self-expression. Then, whatever they share, validate it. Accept everything the child says, even if he is clearly exaggerating, as we are allowing space for his imagination to develop. If you are leading a group of kids, reaffirm everyone’s experiences, and make sure no child is confused, lost or unhappy about it. Finally, be sure to manage your own expectations. Meditation is a process and can take some time. It will not make your child a “junior-Buddha” within two weeks. But it will give him or her valuable tools to know themselves better, manage themselves better, and create a space of calm and strength inside themselves. I reviewed dozens of meditation techniques that I have practiced and taught, and selected the most suitable ones to be taught to kids and teenagers. Here you will find some of them, with brief instructions (not the full scripts, otherwise this article would be more like a book!). All these practices are adapted from traditional meditation techniques, and the essence of each meditation is presented. Adaptations will need to be made according to the age and personality of the kids. For all these practices, apply the basic guideline of “whenever you notice that your mind has wondered, gently bring it back to the practice”. Close your eyes, and take a deep breath. Imagine that your ears become very big. As big as your body. They can hear everything. Pay attention to the sounds you hear in the room you are in. Stay a few seconds with each sound, and then move on to the next. Then start hearing sounds very far away. See how far you can go. Just let the sound be the sound—don’t think about it, and don’t give it a name. Your ears neither like nor dislike any sound… they just hear them all as they are. Now see if you can hear the sound of your own breath. Keep hearing the sound of your breath, moment after moment. Benefits: Encourage the kid to use the sense of hearing as a door to being present, open and calm here and now. This helps develop non-judgement awareness, and bring about mental stillness. Play an instrumental music piece, and ask the children to listen carefully and imagine what is the story that the music is telling. In the end, ask them to share their stories. Benefits: Develop their faculties of imagination and abstract thinking. Play an instrumental music piece, and ask the child to choose one of the instruments, and follow only its sounds, exclusively. Benefits: Develop the ability to focus in the midst of distractions. Close your eyes, and pay attention to the sounds you hear. Follow the sound back into silence. See how long you can follow it before it disappears. Try to find that last moment when the sneaky sound escapes into silence. Benefits: Great for calming down the child, and sharpening their sense of hearing. The universal mantra om has a deeply calming effect on the mind—especially due to the prolonged “mmmm” sound. It can even put your baby to sleep. Close your eyes. Take a deep breath in through the nose. As you are breathing out, slowly chant OOOOMMMMMMMMMMM. In the beginning it is loud, and then slowly it gets softer and softer until your exhalation is finished. Repeat the process many times, breathing in deeply, and chanting OM when breathing out. With every breath, try to make the OM sound last longer, and be softer. Then close your mouth, and repeat OM in your mind. Repeat once when breathing in, and once when breathing out. Keep paying attention to the breathing, and repeating the mantra in sync with it, for the rest of the meditation. You may want to skip steps 6 and 7 with younger kids, and just keep it to the vocal repetition. Benefits: Has a deeply calming effect on the body, mind, and emotions. Integrates speaking, hearing, and breathing, and gives a sense of contentment. If done in a group, it can create a stronger connection between the students chanting together. Make the room dark, shut all the windows (so there is no breze), and light a candle. This different atmosphere, coupled with the fact that most kids love fire, will make it an enjoyable practice for them. Sit two to three feet away from the candle. Open your eyes and gaze at it gently (don’t force or stare). Keep your eyes watching the flame very carefully, like a hawk watches its prey. Don’t move the eyes neither left nor right, neither up nor down. After two minutes close your eyes, and look at the afterimage of the candle that may appear in your mind. Play with that image—see if you can make it stay quiet in the center. Or try changing its size, color, or brightness. After a while, open your eyes, and gaze at the flame again for some time. Then close your eyes and repeat the process. Benefits: This is an excellent practice for developing focus, self-confidence, and the ability to visualize. For full details and variations, see this article. Kids usually have a better ability to visualize than adults. The key to making this meditation interesting is letting them pick an object they are fond of. Close your eyes, and imagine a blackboard in front of your eyes. Now imagine that you are drawing your favorite animal on the blackboard. You have pieces of chalk in many colors, so have fun! Open your eyes, and draw the animal on a piece of paper, just as you had visualized it. For one minute observe all the details of that object/toy. Close your eyes, and visualize the object in front of you. After some time, open your eyes and take a second peak at the object. Close your eyes again, and now try to visualize it in your mind with even more detail. Benefits: Both practices further develop children’s ability to visualize. It also makes them more imaginative and increases their power of focus. Breathing awareness is the most popular form of meditation in the Buddhist tradition, and gave rise to the modern mindfulness movement. Here are two simple methods to teach to children. Be aware of your breathing. Feel your belly or chest moving up with the inhalation, and down with the exhalation. Breathing in mentally say the number “10”; breathing out again think “10”. Then again “9” and “9”. Then 8, 8. All the way to 1,1. If you get lost, start again from 10. Your challenge is to get from 10 to 1 without forgetting the breath. Benefits: Increases body awareness, concentration, and relaxation. Instead of counting the breaths, visualize that you are breathing in a golden color, and breathing out a grey color. Breathing in, the gold color fills your entire body with good things—happiness, calm, energy. Breathing out, the grey color takes away all bad things. Benefits: As per version 1, but with an enhanced effect on emotional well-being. Close your eyes, and feel your whole body. Try to feel the position of your body, the size it occupies in the room, and its weight. Now imagine that your body is a mountain. It is as big as a mountain, and as heavy as a mountain, solid and firm on the ground. Every time you breathe out, feel that your body is becoming more and more like a mountain. Each time your body feels more still, relaxed, and solid. You feel rested and calm. When you are about to finish the meditation, feel your body getting back to normal with each inhalation. Benefits: Great for calming down, relaxing, and developing body awareness. Also a good practice for falling asleep. Lie down comfortably. Close your eyes. Imagine that your body is becoming very light. So light that it has no weight anymore, and it begins to float upward. Your body is light and transparent, and it’s floating through space. It goes out of planet Earth, and it’s floating around the galaxy. Enjoy how it feels light and free. Your mind also feels light and free. After a while, start coming back to earth, and to the room you are in. Feel the body becoming solid again. Slowly move your toes and fingers, until you are ready to finish the meditation. As a variation, after step 4, you can ask the child to imagine that he or she is visiting another planet. This makes the practice more imaginative and creative, which some kids might enjoy. If you adopt that variation, at the end ask the child to share how the journey was, and what the planet was like. Benefits: Helps to deeply relax and cool down. Problems and emotions feel very small after this exercise. It’s good for kids who are emotionally stuck, overly shy, or sad. There are many types of walking meditation, most of them involving synchronizing slow steps with our breathing or a mantra. But what to do with kids who are hyperactive, and can’t do a slow walk? Here is a method I created to help bridge the gap with energetic kids. Frame it as a challenge: “Let’s see how well you can follow the beat!”. For this method, you will need a metronome app (such as this one), or a real metronome. Set the metronome to a fast speed, such as 150 or 200 beats per minute. Ask the kids to walk (nearly run) with steps in sync with the beats—every beat is one step. After a minute, start slowing down the beats, and ask the children to pay attention and keep pace with it. Slow it down all the way to 30 beats per minute. At this point, the kids will be walking calmly and peacefully. After a while, instruct them to sync their breath with the steps, so that each breath in takes two beats (4 seconds), and each breath out also takes two beats. Benefits: This method is very dynamic and engaging. It will take the kids from agitated to zen. This practice is quite elaborate—including a full body scan, affirmations, visualization, breath awareness, and more. For more details on how to guide it, including scripts for kids, see the chapter “Meditation for Children” in the book Sure Ways to Self-Realization. The tradition of Yoga has many powerful breathing exercises, called pranayama. This is a simple one, which kids are likely to find interesting. Close your mouth, but keep the teeth apart. 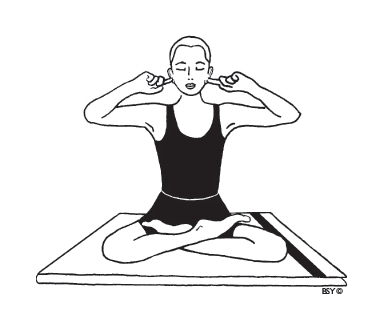 Close both your ears with your thumbs or index fingers, like so. Keep your elbows raised horizontally. Breathe out slowly, while making a continuous and smooth humming sound, “huuuuuuummmmmmm”. As you exhale, feel the vibrations of the hum all through your head and chest. Practice for about 5 minutes. Then close the mouth, breath normally, and become aware of your natural flow of breath. Be aware of the effects of the humming on your body and mind. Feel the calmness and relaxation that was created. Benefits: This method easily creates a sense of calmness and ease in kids, regardless of their capacity to focus and pay attention. These last two practices require a bit more mental development on the side of the kid, so it may be suitable for older kids only. This particular technique is better practiced after other techniques, once the kid is already calm and attentive. Start by practicing mindfulness of breath (see above) for a couple of minutes. Then become aware of your mind. Observe the thoughts, feelings, words, and images showing up in your mind. Watch your thoughts and feelings come and go, like clouds in the sky. There is a gentle breeze flowing, so all clouds are moving—none of them can stay. If you like, you can label the clouds as they come. For example, “thinking” if it is a thought, and “feeling” or “memory” if it’s a feeling or memory. Just place the label on the cloud and let it pass. There is no need to resist any thought, or to interpret them, or to talk to them. Simply watch them come and go, without liking or disliking them, and without judgment. Instead of the clouds in the sky metaphor, you can use any other suitable image. Examples: bubbles in a creek, cars on the street, scenes of a movie, etc. Benefits: This practice develops greater self-awareness, and the ability to regulate one’s thoughts and feelings. The child learns to observe thoughts and emotions, rather than just take them at face value and react automatically. As a result, there is greater emotional intelligence and psychological well-being. Sit for meditation, and close your eyes. Remember a time in your life when you felt deeply loved, accepted, and cared for. Remember how that felt in your body, in your mind, in your heart. Place your hands on the middle of your chest, and hold on to that warm feeling. Feel it deeply. Repeat that affirmation in your mind slowly, many times, while connecting with the feeling. With each repetition, feel a warm and pleasant light spreading from your chest throughout your body. Think of a person you may be having a conflict with. It could be a friend, teacher, classmate, or your parents. See that person in your mind, and imagine that you become him/her. You are in that person’s shoes now—with their dreams, their past, their wishes, and their problems. Notice how everything feels different. Try to understand that person from the inside. You can also imagine that light is coming from your heart and embracing that person. This helps make the feeling more concrete. At the end of the meditation, notice how the way you feel about that person has changed. Benefits: This is a great meditation for developing positive emotions, and letting go of negative emotions such as anger, hatred, indifference, selfishness, ill-will, and sadness. It also helps develop empathy, compassion, kindness, and a sense of social connection (especially the second variation). [If you are already part of my mailing list, don’t worry, only one instance of your email will be kept. No duplicate messages will ever be sent]. If we want to create a better society—one that is more peaceful, prosperous, and fair—, transforming our young generation is a good place to start. For this goal, meditation certainly serves an important purpose, giving the young a powerful way to manage themselves and grow into kinder, abler, and more mature individuals. There is a movement of teaching kids meditation, mindfulness, and yoga. It is growing, and the children who master these tools will, as adults, have an unfair advantage over those who didn’t learn those tools early on. My intention with this article was to share the benefits of meditation for kids and to explain some of the many methods of meditation that can be adapted for children and teenagers. Each kid will have different techniques they will benefit from the most, so it’s important to allow them to be exposed to different practices. Please share this post to help raise awareness.